The largest chain grocery store companies in the US have agreed not to sell genetically modified salmon, but over 9000 stores might still be passing off GMO salmon as non-GMO if the industry isn’t required to disclose such information. Without a requirement that GMO foods be labeled, two of the largest grocery stores in the U.S., Kroger and Safeway, will have no way to uphold their recent commitment to consumers who want to know what is in their food. The news that the chains decided to refuse GMO salmon was released Monday by a coalition of food safety, consumer, health, and fishing groups. 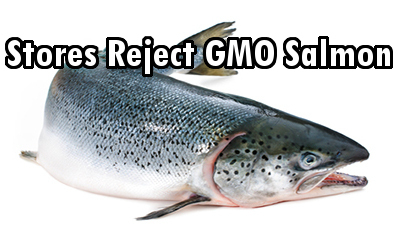 It is a noteworthy choice for the companies to have made –rejecting GM AquAdvantage® salmon – regardless of whether the U.S. Food and Drug Administration approves it for public consumption or not. It is indeed a mindful gesture to the millions of activists who have stated clearly they don’t want GMO foods. Check out Anthony Gucciardi’s video covering how the FDA has been pushing for GMO salmon for years. The FDA has not yet officially given AquAdvantage the green light for their GMO salmon, but they have approved Bt toxin residues in our foods and ignored our demands for more independent scientific inquiry into transgenic crops – so not much faith can be put in the FDA. Trader Joe’s, Whole Foods, and Target have also pledged to refuse to sell genetically engineered salmon, listening to the demands of educated consumers. Cost-co, Walmart, Albertson’s and other retailers have yet to provide consumers the non-GMO promise. “This is good news, as FDA’s human and environmental assessments of the safety of this genetically engineered fish are both seriously flawed,” said Michael Hansen, PhD, senior scientist at Consumers Union, the public policy arm of Consumer Reports. MA-based AquaBounty Technologies created their GM salmon by developing a growth gene which makes the salmon grow to market size in half the time of a conventional fish. What independent tests have been conducted to prove that this same gene wouldn’t become part of our own biological makeup? None, really. There are already multiple problems that GM foods are causing. “Genetically engineered salmon are bad for the consumer, bad for the environment, and bad for our native salmon. We call on all fish retailers to reject this dangerous product that consumers don’t want,” said Heather Whitehead, online campaigns director at Center for Food Safety. The FDA made a preliminary finding for AquAdvantage® stating that GMO salmon for human consumption would not have a significant impact on the environment if, as planned, it is raised in tanks away from the ocean; however, what of human health? And how can one protect wild salmon from interbreeding with GM salmon, the same way GMO crops are infiltrating organic ones? What independent tests have been conducted to prove that this same gene wouldn’t become part of our own biological makeup? If you’ve ever eaten Pacific Chinook salmon, you’ve already consumed the transgene being added to the Atlantic salmon (though not the Pout’s promoter). So what prevented the gene from becoming part of your biological makeup? Your stomach did. You digest DNA quite thoroughly. It gets broken down into constituent molecules and then re-assembled from scratch according to your inherited genes. It’s like crushing Lamborghini sports cars and making a minivan out of them. No matter the provenance of the metal, the minivan will never drive like a Lamborghini. You will never grow like an Atlantic salmon with Pacific salmon genes because that’s not how genetics works. Your cells have a nucleus that serves to protect DNA. That nuclear membrane only allows certain messenger RNAs through it. Not foreign DNA. From one perspective, it is very unfortunate that the DNA is so well protected because we could fix many genetic diseases if we had the ability to deliver DNA “patches” to fix faulty parts. But I wouldn’t wish away my nucleus even if I had a genetic disease, as it undoubtedly prevents more trouble over the long term than it causes. Thank God for Kroger and Safeway to let choose to be poisoned or not. My God what is this world coming to. Crimes Against Humanity to slowly kill us are legal! Excellent news. I shop at Safeway, Trader Joe’s and at Fred Meyers, owned by Kroger. Soon, salmon will be back on my table. My local Fred Meyers is remodeling to make room for more organic food. Good on them! Really encouraging to see that consumers have power. Hope we support these stores by buying from them.